Jeff Frampton and Jayme Caughron, both of Chillicothe, were recognized at the 2014 Missouri FBLA Leadership Conference on April 13 in Columbia, Missouri. In Future Business Leaders of America (FBLA), the Businessperson of the Year award recognizes outstanding leaders from the business sector who have contributed to the success of FBLA. 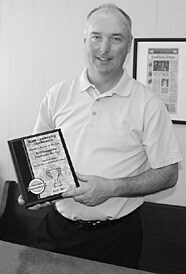 This year, Grand River Technical School nominated Jeff Frampton, Chillicothe Hy-Vee Kitchen Manager. Frampton received his award at the State Leadership Conference on April 13, 2014, in front of over 3,700 FBLA members representing 450 chapters from across Missouri. Frampton was nominated by the GRTS chapter of FBLA for his willingness to help the students with their fundraising opportunities. FBLA is involved in community service activities such as Partners in Education, raising money for the March of Dimes and other organizations. Other local events the FBLA chapter assists Frampton with are the 'Freedom Fest' held on the 4th of July in Simpson Park, the annual Piccadilly dinner/auction and the 'One-Night' marriage event hosted by Cornerstone Church. They also raise money to offset the costs of competition at the district, state and national levels. Local individuals or organizations using Hy-Vee to serve and cater their events. Frampton will then ask the local FBLA chapter to assist in serving the food with the proceeds going to the FBLA chapter. These opportunities that Frampton provides the students not only raise money, but also help them develop communication skills and learn to work together. "I was really impressed with the conference and the students who gave campaign speeches," Frampton said. "They were very professional." Frampton has been the kitchen manager at Hy-Vee in Chillicothe for 19 years since transferring from Leawood, Kan., where he was kitchen manager. 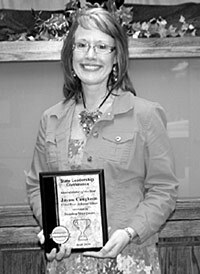 Jayme Caughron, director of Grand River Technical School, was recognized as an Administrator of the Year at the 2014 Missouri FBLA Leadership Conference. Advisors Sondra Sturguess, Jenny Hughes and Susan Mayers nominated Caughron to acknowledge her ongoing support of the local FBLA Chapter. Caughron has been a business teacher for a total of 14 years (seven years at GRTS) and an administrator for 10 years at Grand River Technical School. She has been an FBLA advisor since 1997 with the GRTS Chapter. "Jayme is always willing to assist the students in their competitive events by reading reports, listening and helping brainstorm project ideas, judging at district competition, and conducting officer interviews," Jenny Hughes, Business Technology instructor at Grand River Technical School, said. "As former FBLA advisor, Jayme is also very supportive of the chapter's projects and demonstrates her commitment to students' success by her encouragement and support." "The mission of FBLA is to bring business and education together in a positive working relationship through innovative leadership and career development programs," Hughes said, "FBLA appreciates the many local businesses and school staff that help the members fulfill that mission." This page updated by BK Web Works 05/28/2014.